On April 8th in Round Rock I came across this blister beetle in the genus Pyrota, apparently P. lineata or P. bilineata. 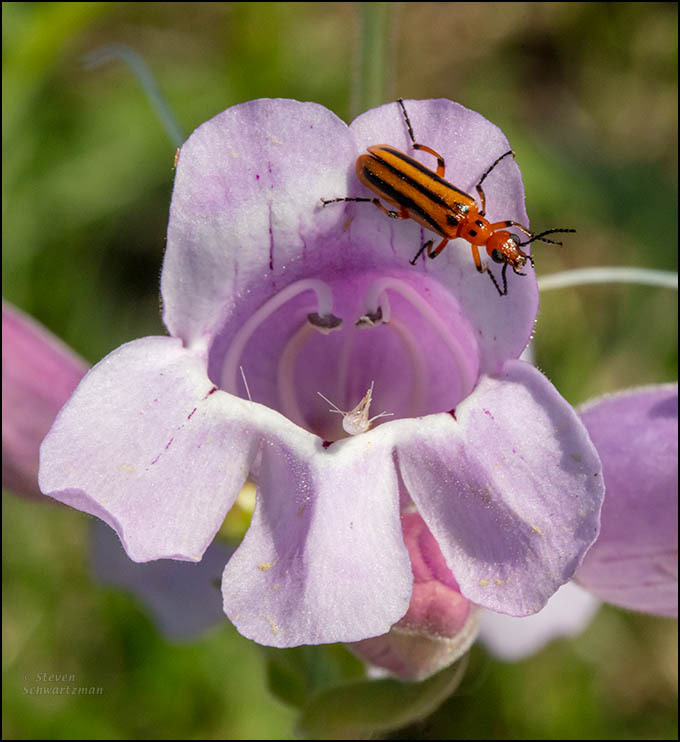 The flower is the kind of foxglove, Penstemon cobaea, that you saw from farther back in a post here last month. 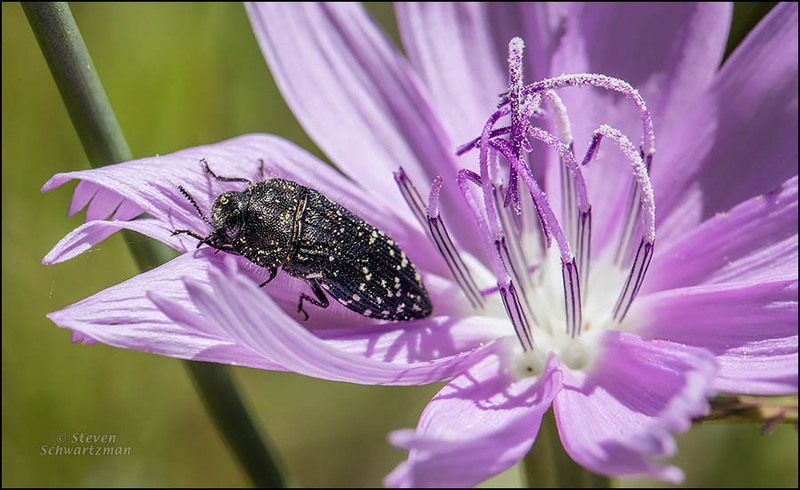 Thanks to bugguide.net for identifying the genus of the beetle. My first photo stop on May 1st was at the old Merrilltown Cemetery on Burnet Rd., at whose edges in past years I’d photographed plenty of American basket-flowers, Centaurea americana. 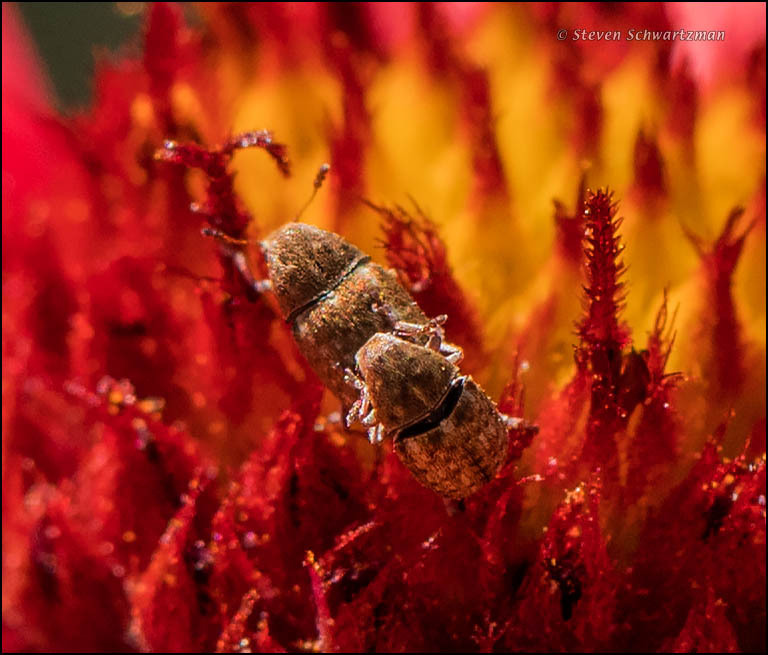 Though it was still early in the season, a few basket-flowers had opened, and on one of them I found this tumbling flower beetle. 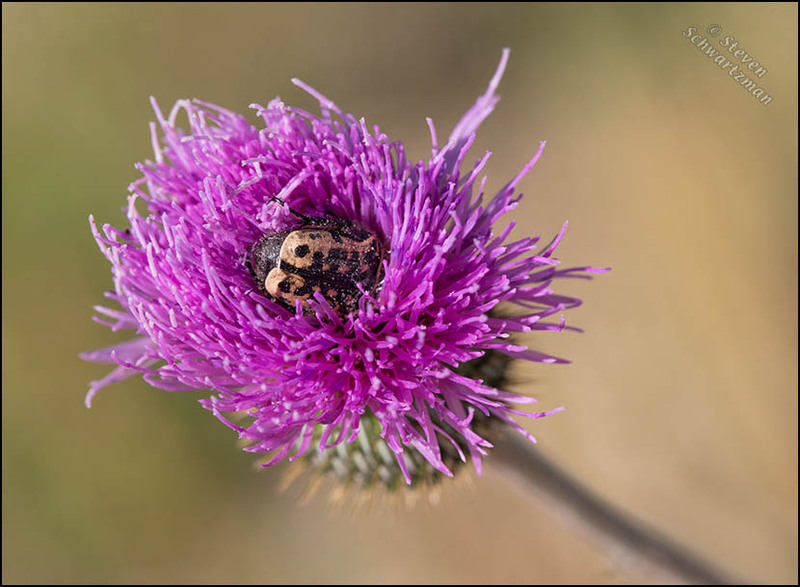 In a comment yesterday on the recent post showing plants flowering on the Blackland Prairie, Lisa asked whether I had a closeup of a Texas thistle. I answered that I might show a current picture of one in the days ahead. Now let me be more decisive, take the thistle by the thorns*, and post a photograph I took on May 6th of a Cirsium texanum in Cedar Park. 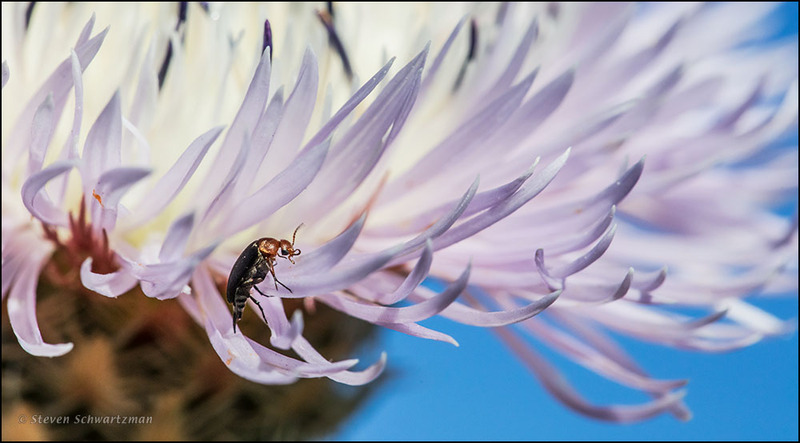 Burrowing euphorically into the flower head was a Euphoria kernii beetle. * Technically speaking, a thistle has spines or prickles rather than thorns, but you wouldn’t want me to pass up a good alliterative alternative to “take the bull by the horns,” would you? Not far in space or time from where I photographed the crab spider on a Texas thistle at the Purgatory Creek Natural Area in San Marcos on April 27th, I saw Acmaeodera beetles on flowers of the skeleton-plants (Lygodesmia texana) that were out in goodly numbers (both the beetles and the skeleton-plants). 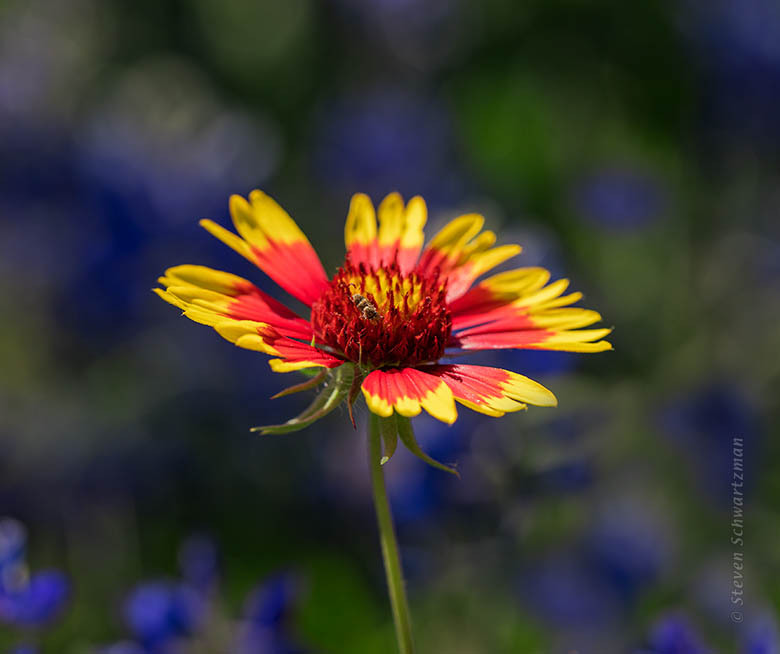 Two of the most familiar wildflowers in Texas are the firewheel (Gaillardia pulchella) and the bluebonnet (Lupinus texensis), both of which you’ve already seen here more than once this year. The main reason I’m showing you this picture now is the action taking place in the firewheel’s red light disktrict. This photograph is from April 4 along Bluegrass Dr. in my northwest part of Austin.